The class should be able to build a three-story house model according to specified requirements and calculate the money required to wallpaper and carpet all the rooms. 1. As a homework assignment the prior evening, students should be asked to research in newspapers or online for wallpaper and carpet pricing that appeals to them. 2. 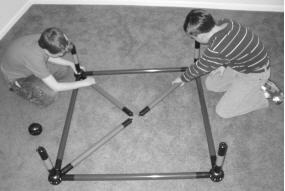 To provide students with a starting point, teachers should construct a square using four 36” Toobeez tubes. Teacher Note: The multi-holed equator of the spheres should be in the horizontal position at each corner. 3. Teachers should prepare the following blueprint instructions in advance and make enough copies for one per student. 1. Read aloud the following Activity Challenge Box to the group. Challenge: The class should be able to build a three-story house model according to specified requirements and calculate the amount of money required to wallpaper and carpet all the rooms. You have been hired as contractors to build a house with the requirements listed in the building blueprint directives. 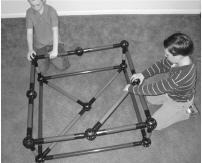 Using the Toobeez set, build a model of the described house. 3. 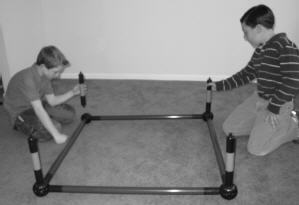 Teachers should inform the class that the provided structure from the “Activity Setup” will serve as the foundation for the first floor. No floor can be wider than the first floor. 4. 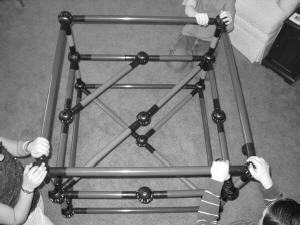 Appoint two students, preferably more tactile learners, as builders to physically construct the model following cues provided by the class. 5. In an organized manner, students should be encouraged to make suggestions for the builders to meet the following blueprints. Teacher Note: Reinforce that all opinions are equally valuable. 6. After successfully building the blueprint model, have the class draw a floor plan layout for each floor in their notebooks. Teachers should also assign numbers to each room for easy identification and have students copy these numbers. Teacher Note: Remind students that there are three first floor rooms, three second floor rooms, and only one roof garden on the third floor that has no walls. 7. One student, the interior decorator, should measure, in inches, the floor dimensions area of each room and the outermost wall dimensions of the house model. Teacher Note: As there are no room dividing walls, wallpaper estimates will only be done on the outermost walls of the model house. 9. Students should convert inch measurements into feet. 10. At their desks, students should calculate the floor area of each room and the area of each outermost wall in the model house. 13. 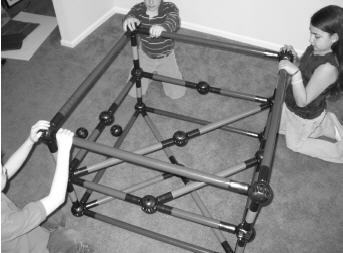 After the activity, gather the class together and ask the following question: “How can calculating the area of room surfaces be useful in house building and decorating? 14. Finally, move to the “Activity Discussion and Processing” section of the activity. If you owned a house, why might it be important to calculate room dimensions before decorating? What additional real-world scenarios require the ability to calculate the area of various geometric shapes? 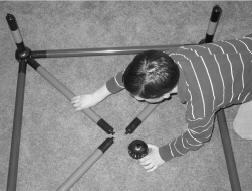 What steps in this activity require perseverance and cooperation? 1. A more crowded house. Challenge the class to build a three-story house with more rooms than laid out in the original blueprint. Have them recalculate all the areas and materials cost and determine the effect on cost. 2. A more detailed design. Review drawing scaled models. Split the class into groups and assign each group a particular room within the house model. 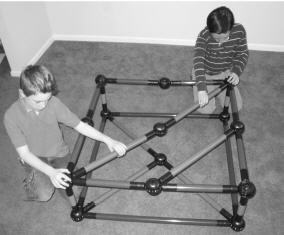 On graph paper, help students draw a scaled floor model of their assigned room. 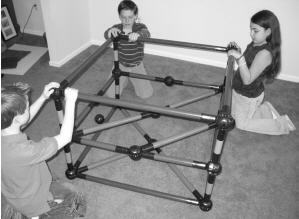 For homework, students are to research room furnishings, both dimensions and cost. They should verify these furnishings can fit into their assigned room by drawing scaled representations of these furnishings within the drawn floor plan. Finally, students should calculate the total cost for decorating the room. Review drawing scaled models. Assign each student a room to decorate. Aid students in drawing scaled models of the floor surface for each room and the outermost walls associated with each room. Inform students that they must also imagine that their room is surrounded by walls on all sides with a 6’5” doorway on one of the inner-facing walls. For homework, have students calculate the surface area for the floor and each wall. Using the prices of their wallpaper and floor treatment, have them also calculate the total cost of covering the walls and floor. Finally, have them calculate the volume of their ssigned room.